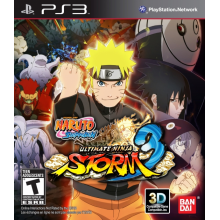 Naruto Shippuden: Ultimate Ninja Storm 3 is a legitimately good Naruto fighting game. There are a ton of characters, a good amount of content, and a pretty decent online component. There are some issues, however, which will leave fans of the series wanting a lot more. The biggest issue with the game is the redundancy of a lot of the characters. There are literally, 4 different iterations of Naruto and Sasuke, each. Each one has its own place in the timeline but ultimately, they all play the (mostly, there is a little variation) same. They have different ninjitsus and ultimate jutsus (special moves and ultimate moves), but that’s really the extent of it. Even the DLC Goku costumed Naruto doesn’t use the power pole, at all. Ever. This is an extremely critical thing to be annoyed with but it also factors into gameplay when 4 each of 2 different characters plays essentially the same way. The other big issue is that each character has only 1 ninjitsu and 1 ultimate jutsu. Now if you use awakening (a transformation), the ninjitsu might change and some characters gain 1 or 2 extra ninjitsu via the support buttons, but by and large the characters are all very limited in what they can do. With the wealth of ninjitsu and moves that can be drawn from the manga and anime this is very disappointing, but at the end of the day it’s really only an annoyance if you’re a huge fan of the series. The graphics are absolutely gorgeous. The cel-shading is done just right and all the moves and video (more on this in a bit) do the anime absolute justice. The videos, however, and some of the boss battles are absolutely awe-inspiring with how powerful they are. The opening video and very first battle you fight in are literally some of the best I have ever seen in any fighter, and that’s truly saying something. It blows what almost every other anime-inspired fighter has done out of the water, and upcoming games should take note of this presentation style. The music is also legitimately awesome. There are several points within the game that use some truly emotion-driven soundtracks, and it’s one of those random touches that really bumps this game up. The game has a few different modes. Ultimate Adventure, which is the story mode, Free Battle, and Online Battle. Ultimate Adventure has a wealth of content in it that you can’t access from the menu including a collection of all the items you’ve gathered so far, which includes videos of ultimate jutsus, substitution items, ninja card images, and so on. You can also access the Ninja World Timeline which allows you to go back and replay battles, watch any of the cutscenes you’ve experienced so far, and access battles which happened before the Naruto Shippuden era. A big part of the game revolves around Legend vs Hero choices. During many boss battles, you have the opportunity to essentially fight the boss on hard mode or easy mode. Legend (hard) mode is often doing it by yourself with no help from any support characters, but sometimes it’s an entirely different fight or series of events (which all lead up to the same outcome once you win). Hero (easy) mode is basically you doing it with help or having an easier time because of someone’s sacrifice or power up or what have you. As you win battles, especially those where you have to make a decision between Legend and Hero, you gain points in those two areas and eventually level them up which allow you to equip stronger Legend and Hero ninja tools (items), which make you a bigger threat in combat. Overall the combat system is really well designed aside from the whole everyone only having two moves total and some combos issue, but growing pains are a must in any good series. Overall, this is a great game and a great addition to the Naruto videogame series. If you’re a fan of Naruto or a fan of anime/manga based fighters, you’ll enjoy it although in the end you will be left wanting more. NAMCO BANDAI Announces its Saint Seiya: Brave Soldiers DLC Extravaganza!